All are welcome to attend the first of the Summer Term’s screening and discussion sessions which will take place on the 8th of May in Jarman 7, from 5pm to 7pm. 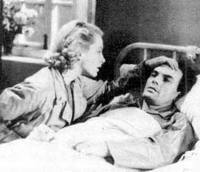 John Baxter’s film starred Deborah Kerr and Clifford Evans (see picture above) and was based on Walter Greenwood’s 1933 novel of the same name. Set in the north of England during the Great Depression, the plot concerns unemployment and poverty amongst the working classes. Due to its subject matter, the novel was not permitted to be filmed by the British Board of Film Censors until 1941. Its realistic approach to social problems prefigures the Social Realism British films of the 1960s. The intersection (or perhaps inherent contradiction) of realism and melodrama will provide a focus for our discussion, while the matter of class is also an important one for us to consider. Do join us for this critically acclaimed piece of British film history.